I love creating free printables for you guys. They are a fun way to bring something a little bit fresh and new into your homeschool without costing you a cent. Did you know that I offer my free printables only to my subscribers? Did you know that if you subscribe you will receive a free 2 week unit study about Beavers? Did you know that if you subscribe you get a new printable sent directly to your inbox EVERY WEEK???? Today I have created a printable owl coloring pages and copywork bundle for you. It’s a bit frilly, but my boys like coloring flowers as much as my girls so depending on your kids, this could easily work for anyone. The graphics are fairly simple though the copywork is challenging enough for Grade 1-3. Make sure to pin this on your printables board for later! 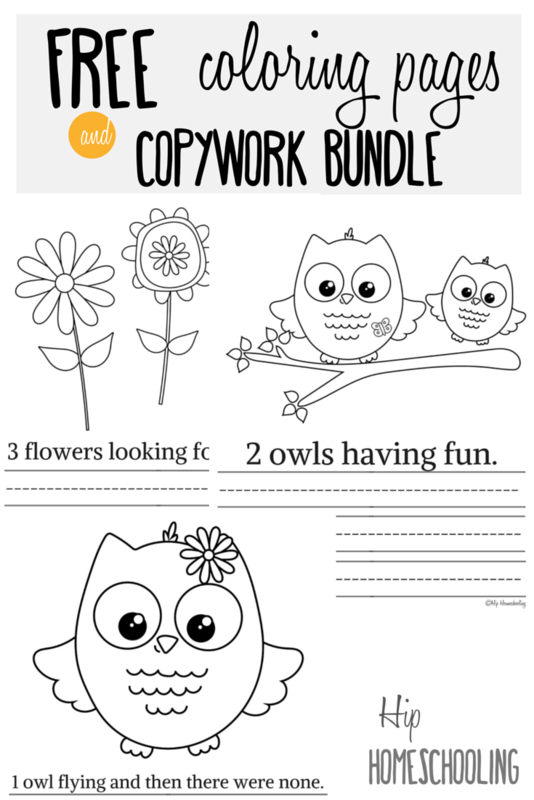 Grab your free printable owl coloring pages and copywork bundle here! To download your freebie, go to your email provider and add rebecca@rebeccaspoonerpgblog.com to your contact list to make sure you get the email (they can sometimes disappear in your spam folder otherwise). Then simply come over here and enter your name and email address. You will automatically receive the free download link in your inbox. I want to see your finished pages! I’m not just saying that, post your completed pages on Instagram and tag me @rebeccaspoonerpg so I can take a look at your kids’ awesome creations, or come post them on my Facebook page! Let’s build little artists together! What grade are your kids in? Comment Below! Since you asked, my kids are son 15, son almost 13, daughter almost 11, daughter almost 9, twin sons almost 7 and baby boy almost 3. Thinking I might start working with my youngest son next school year… Not sure.. Do you have a bible curriculum suggestion that is affordable that would work for all ages, this is my first year homeschooling and I did not do well with Bible this year. 🙂 I am glad I found this site! God bless you!